There are also more industrious and energetic bloggers out there who have made it their mission to make sure that the 40 kids who were told they would get ipads get their ipads. They are doing so with a focus on transparency and verifiable details in communication. It is not lost on them that after being bitten by an online scam promising ipads no one is going to buy in to the next blog that comes around promising ipads. So they’re not promising. They’re trying. The best that they can. Because they know the hurt and frustration that we feel. They too were chosen as winners in the marissa’s bunny needs based ipad giveaway. Me? I hope that soon I will get myself back into the mindset where I can jump in and offer my help to them because I’d love nothing more than to help someone else feel better from this whole situation and right now just receiving an ipad doesn’t feel like it would be enough to do that. Yeah, I was pretty upset. Really upset. But I knew that I wanted to help and eventually I got over the anger with the help of some new friends named Ken and Heather. And that is why this post has been so hard to write. It’s about more than just an ipad. More than just a toy or a tool. It’s about something bigger than just my family. Bigger than just my son. It’s about being a part of a community of people who look out for each other. Whether they’ve met each other or not. People who saw an injustice and a promise broken but said here, I’ll help. I’llfulfill that promise. I can’t thank them enough, for the ipad, for the community, and for the friendship. Since that time Ken and Heather and I have kept in touch and grown closer. We’ve never met in person and I’ve never even heard either of their voices but I consider it an honor to call them “friends”. Especially due to the amount of awe I am in of the work that they have done. To date they have given 22 ipads to families of children with special medical or communication needs all over the country. 22 families changed by technology, by communication and by a community. So given all of that, I am incredibly excited to announce that Ken and Heather have asked me to become a contributor to the Mission iPossible project! You can read Ken’s announcement and the explanation of this post’s title here at Mission iPossible. I’m very excited and yes, I am honored to be asked to join such a worthwhile cause. You’ll see that I will be posting over there in the next few days and I hope that you will join me. But my joining the team is small potatoes. As excited as I am about this opportunity, whether or not I am a part of the Mission iPossible group, it is much more important that you all know that there are only 5 more days to enter for a chance in The Third Mission. Mission Three is a give-away of three iPads. (Mission Four will be 4 iPads etc, etc, . . . ) and the deadline to enter by leaving a comment on the mission announcement page is on Friday. So please, take a look, read the rules and then tell everyone you can. Facebook, and the Twitters, blogs and emails. Spread the word all week. I don’t really want to elaborate much more than that actually because I would prefer that you jump on over to the Mission blog and follow along a project that means a great deal to me. Don’t worry, don’t worry my participation there won’t affect my downright robust posting activity here (3 posts in a single week? Geeze I better slow down. How do I do it?) I’ll post just as sporadically as I always do. Now you’ll just have two places to look for it. 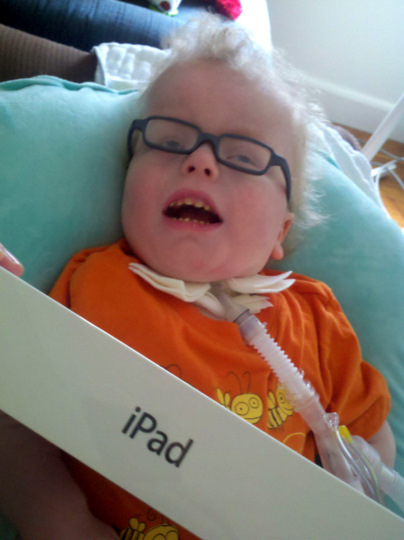 Help Mike give away ipads to children with special needs. 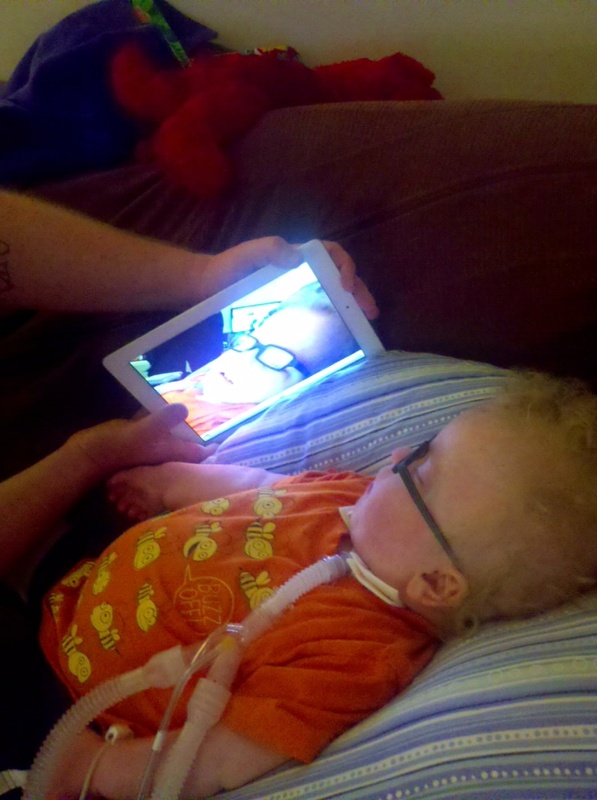 I think [the iPad] could also be used in aiding communication for children like Liam. Press this section of the screen to tell mommy your diaper needs changing, press the green box to say ‘I’m hungry’. Press the red section after a kiss to tell Mommy that you love her too! Think Stephen Hawking but simplified. Although he can make sounds vocally, Liam’s diagnosis may prevent him from “speaking” to his mom and I. He can still communicate needs and wants. He can still appreciate cause and effect relationships and I’d like to see if the iPad interface could be customized in ways that flash cards and the big buttons and switches (which we currently use) can. As he grows older I think this could come in handy. Soon after writing that I quickly moved on to other things seeing as how coming up with the money for an ipad wasn’t very likely. 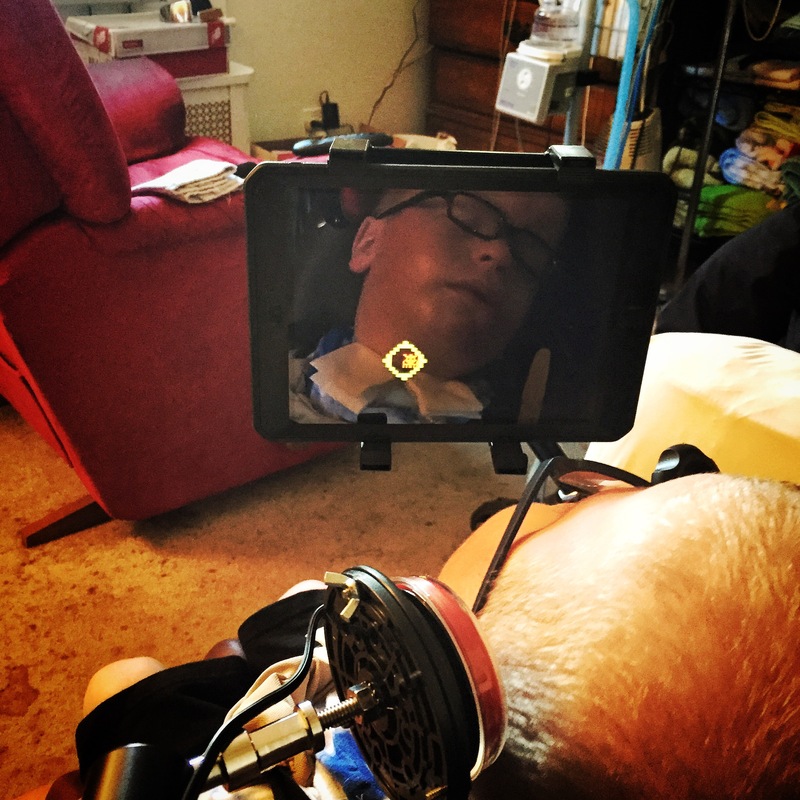 Luckily many, many people much much smarter than I am were working on apps to aid in teaching and communication and the ipad is becoming a must have for families with special needs. In the past few days I have found that there are popping up all sorts of resources to put ipads in the hands of kids who could use them in increasingly helpful ways. Enter Mike. Mike is father to Marissa who suffers from infantile spasms, a term long time readers here will recognize. Mike runs an extraordinary blog about his family’s journey and has used that blog to help as many other special needs families as he can. Mike and his employer are giving away 5 ipads in a contest! You can find all the details here at the contest page. So onto how you can help. You can tell everyone you know. I know some of you have special needs children yourselves and so I’m telling you to get your butts over to that page and enter your story. I also know that some of you work with children with special needs every day. Tell them about it. Tell those families, tell your friends, tell Facebook and the Twitter. Let’s all help Mike as he starts his new foundation by helping as many families as he can. Update: In a tweet this morning Mike sent out word that there has been a huge response to this contest. He is asking for anyone who may work for or know a retailer or corporation who would like to donate so that the program could be extended or expanded. If anyone out there knows someone who fits that bill please send them to www.marissasbunny.com to help. Thanks.